Another New Copy of EarthBound? 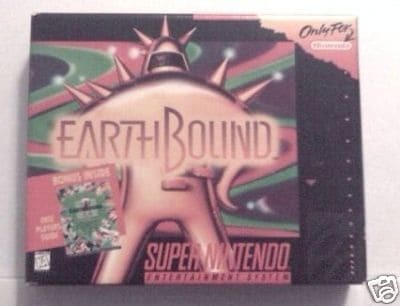 Remember how this brand-new, unopened copy of EarthBound sold over $1000 just a few days ago? Well, there’s now another brand-new copy on eBay, being sold by someone else. I don’t know if it’s legit or not, but after the news about the $1000 copy hit everywhere else on the Internet, I did read lots of people commenting about how they should sell their copies of EarthBound and call it brand new and get a ton of money for it. Maybe most of them were joking, but complete sets of EarthBound do sell for quite a lot, even if they’ve been opened. Just see here! I saw a $380+ one sell earlier this week even. 18 Comments to Another New Copy of EarthBound? F it! I hate when stuff costs a lot! I have a copy of EarthBound that is supposedly new; I don’t know for sure if it is, because I’m not the original owner (meaning I bought it from the person who claims to have bought it from a store when it was on clearance). I think things like that are a huge problem because anyone with all the parts to the packaging can claim it’s brand new and there’s no way to tell except to open the thing up and check for scratches on the cartridge pins. What people dont realize is it isnt that hard to just shrink wrap a snes box yourself…. The problem with EarthBound is that EarthBound boxes WEREN’T shrink-wrapped. Which actually makes it even easier… if you have a tape dispensing device that makes professional clean cuts, which you don’t have to be the head cashier at Wal-Mart to be able to afford. I had a friend who doesn’t even care anything about Earthbound, but he cares about making money. After hearing this story he was talking about how he should start buying complete copies, using said tape dispensers, and selling them as new. If there are people desperate enough to scam people that they sell an Earthbound Zero cartridge and pass it off as legit, and they still get buyers, then surely fooling people into buying a fake unopened copy of Earthbound that looks exactly like the real thing won’t be too terribly difficult. This isn’t solely confined to Earthbound. You see sealed copies of Chrono Trigger going for up to $2,000 as well. This type of merchandise is turning into a gold mine, so everyone is looking to cash in. Especially scammers. Yeesh, what shifty business. Let’s just hope this seller is as trustworthy and willing to give refunds (if anything wrong should happen) as the last one. you could make a lot of money this way. all you need is one complete box, package contents, booklet and cartridge. it would take a skilled artist maybe a month to make high-resolution replicas of the packaging and instruction manual in a format for print, and the materials themselves or indistinguishable lookalikes can surely be bought cheap – games are mass-produced, after all. the only thing that’s probably kind of hard to make replicas of is the snes cartridge itself, which i haven’t looked into at all but who knows..! anyway it would be easy enough to just buy used carts, polish them up, and then sell. dozens of these are sold every month very cheaply. selling 5 “brand new” copies a month nets you $5k on average, and it’s easy enough to lie about where they came from – they were sitting in warehouses or whatever. just from doing this you could make a crisp $70,000 every year, or even more. from selling fake copies of this stupid game, you could earn more money yearly than the majority of the united states. also. consider how many OTHER basically worthless toys you could easily reproduce sell for thousands and thousands of dollars just because of what they are. My Chrono Trigger looks like it did the day my mom brought it home from the store and if I wanted to I could make it look like it was officially shrink wrapped and never opened and sell it for over 2 grand. I could certainly use the money but I’ve got scruples and will never do that, even though Chrono Trigger really doesn’t hold much importance to me… (not like EarthBound, anyways). LOL Just saw this last week. I doubt this one is new…if you look at the flap where you open the box, it looks like someone has opened it before. The corners are turned up slightly. The other one I could believe being new, it had absolutely flawless edges. It’s more valuable than 1000 dollars. I’ve seen Cheap Braclets more expensive than that! Earthbound fans beware that their are lots of scams on ebay and its weird that all of a sudden all these new unopened copies of earthbound games are being sold by different people. Man, if it weren’t for Giygas, I’d ask for it for Christmas!